The approximate area of any shape by counting squares. The area of triangle, rectangles and squares. The perimeter of triangle, rectangles and squares. Change between metric units of length (mm, cm, m and km) and know that the units of area are related to the unit used to measure the lengths. Find the area of compound shapes made up from rectangles. Find the perimeter of compound shapes made up from rectangles. Find the area of compound shape made up from triangles and rectangles including where a shape has been cut out. Use a given scale to convert a real distance into a distance on a scale drawing or map. Use a given scale to convert a given distance on a map or scale drawing into the real distance. Construct a rough diagram of an area including distance and direction information. 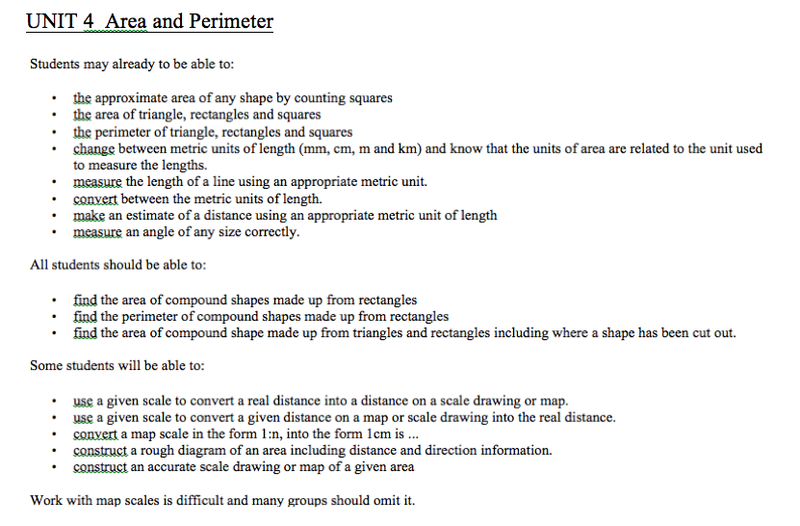 Construct an accurate scale drawing or map of a given area.